Hasti finished her MSc. at School of Interactive Arts and Technology (SIAT) . 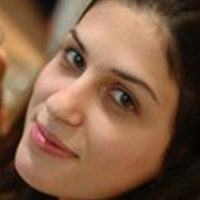 Hasti’s research interest lies at the conjunction of Computer Science and Cognitive Psychology. Her central theme of my interest to be human perception and mostly visual perception. Her MSc. thesis was an effort to understand the effect of painterly depiction on users perception of facial expressions in animated character sequences. The focus of the work is on color and to some extent textures in painterly rendered sequences. She is starting a postdoctoral position in Haptic Intelligence department at Max Planck Institute, working with Professor Katherine Kuchenbecker. She recently finished my PhD studies in the area of tactile design and evaluation, under the supervision of Professor Karon Maclean, in the SPIN lab, Department of Computer Science at University of British Columbia. During her PhD, she researched users’ perception of tactile sensations and devised effective mechanisms and tools for ordinary users to personalize their tactile notifications in mobile and wearable scenarios.